Continuing on from my trip report for Day 7 – I Can Show You The World here is our journey around Japan! 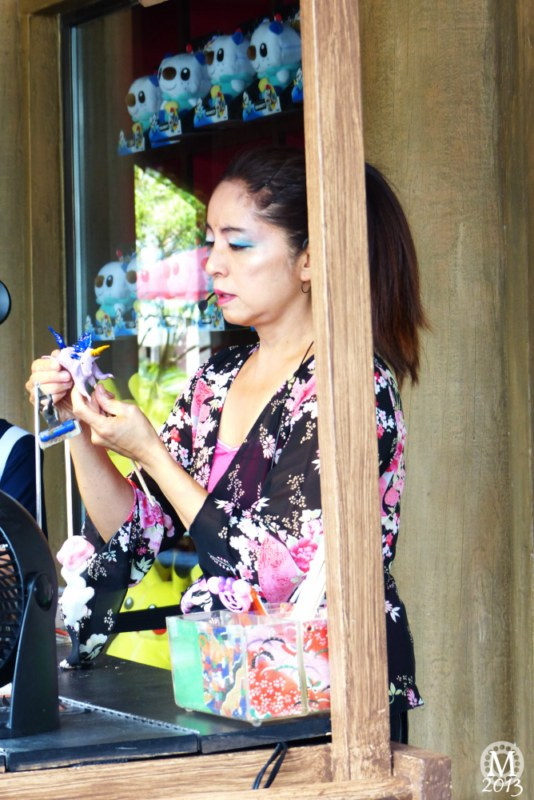 Last time we visited the Japan pavilion, we didn’t get the chance to see Miyuki the Japanese fantasy candy artist – she only performs on certain days and today was a day she would be there! We actually watched her twice that day, so that’s why the pictures below are of slightly different animals! She really is amazing to watch as she pulls and colours candy and forms it into funky animals! You can’t understand a word she says as she makes the creatures, but it is mesmerising! She does ask the audience what they would like her to make. Japan is a country I have always wanted to visit, and if I never get to go there, I get to enjoy the pavilion at Epcot World Showcase! I adore the buildings here and all the Japanese décor and surroundings – fantastic! We didn’t see Matsuriza, the Japanese Taiko Drummers on our last holiday either, so when we saw them setting up, we hung around to watch and listen. Brilliant to watch and it sounded fantastic. I do love the sound of drums! …the sound from this huge drum was so deep and you could feel the beat inside you! I bought a good luck owl for my niece, but not much else. I don’t think we found a magnet or penny press for this part of World Showcase. We passed Kabuki Café on our way to the next country. Knowing we’d be having lunch/dinner soon, we didn’t buy a kaki gori (shaved ice) but I plan to next time!